Parse is a third party “cloud app solution” that is platform independent. You can learn more about it here. This intermediate programming tutorial will show you how to incorporate Parse into a Swift project and store user login details in Parse cloud storage. I’ve prepared a project template that includes the Storyboard and View controller classes. You will find the Login, Sign Up, Reset Password and Home scenes already designed. Running the project should present you with a simple user profile home screen. Before we begin, take a few minutes to familiarize yourself with the project template. 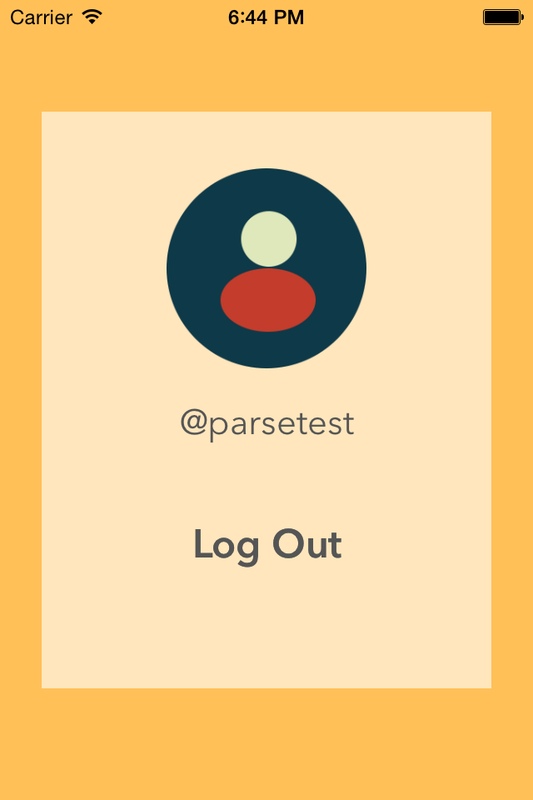 First, login to your Parse account or sign up for a free account. Go to your Dashboard and click “Create a new App”. Name your app “ParseDemo” and click “Create”. Next, at the bottom of the widget, select “Quickstart”. In the successive screens choose the following options: Data – Mobile – iOS – Swift — Existing Project. Now you should be ready to follow the “Install the SDK” steps. 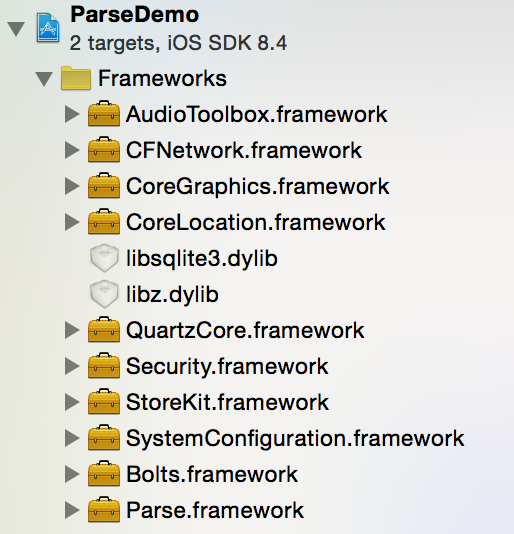 Add the Parse framework and the listed libraries to your app’s Frameworks group. We need to initialize Parse. This is done by importing the Parse and Bolts frameworks and updating the AppDelegate.swift file with the QuickStart generated code. Now, compile and run. Your iOS app should be running with no errors in Xcode. An app user has to login or sign up before navigating to the user’s profile home screen. If the current visitor is not logged in, we need to bring up the login screen. Compile and run the project. Launching the app should bring up the login screen. We don’t have any registered users yet. We need to be able to navigate to the sign up screen to register a user. To display the Sign Up screen go to the Storyboard, select the Sign Up button of the Login View Controller. Control-drag from the selected button to the Sign Up View Controller. When prompted, select the “present modally” option under selection segue. @IBOutlet weak var emailField: UITextField! @IBOutlet weak var passwordField: UITextField! This action method is triggered when a user taps the Sign Up button. It performs a simple validation of the text fields values. If the validation is successful, the action method calls the signUpInBackgroundWithBlock Parse method. The signUpInBackgroundWithBlock method may take some time to finish because it is executed asynchronously. The spinner shows the task is in progress. Once the task is completed, a message will inform the user if the registration was successful or not. If the registration is successful, the user will be logged in and navigated to the home screen. Now, go back to the Storyboard and select the Sign Up View Controller. In the Connection Inspector connect each of the outlet variables to the corresponding text fields. Next, select the Sign Up button. In the Connection Inspector connect the Touch Up Inside event with the Sign Up button. When prompted, select signUpAction: option. In the Storyboard, select the Sign Up View Controller and control-drag from the close button to the exit icon. When prompted, select the “unwindToHome:” option under action segue. Compile and run. Now you should be able to register a user. The above code is triggered when a user taps the Login button. It’s similar to the one we implemented in the SignUpViewController.swift. Except, instead of calling the signUpInBackgroundWithBlock method, we call logInWithUsernameInBackground to pass the entered username and password to Parse. If the login is successful the Home View Controller with the Storyboard Id “Home” will be instantiated. 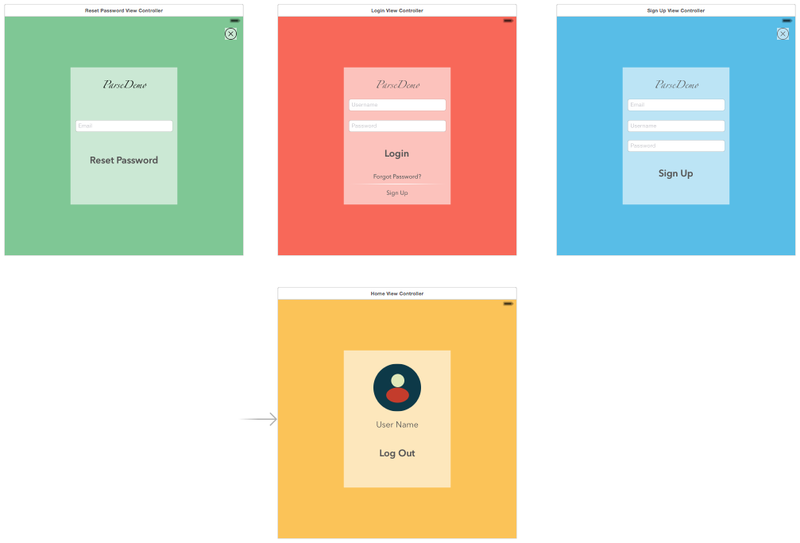 Now, in the Storyboard, connect the Login View Controller outlet variables to the corresponding text fields. Select the Login button. In the Connection Inspector connect the Touch Up Inside event with the Login button. When prompted, select “loginAction:” option. The code calls the logOut Parse method and instantiates the Login scene. In the Storyboard select the Logout button. In the Connection Inspector connect the Touch Up Inside event with the Login button. When prompted, select “logOutAction:” option. Go back to the Storyboard and connect the userNameLabel outlet variable to the corresponding User Name label in the Home View Controller. Compile and run. The home screen will show the current username. The process of setting the ResetPasswordViewController in the Storyboard should be familiar to you by now. Set up a segue from the login screen, connect the outlet variable with the text field, and the action method with the button. Don’t forget to unwind the close button. And there you have it! For your reference, you can download the complete Xcode project here. 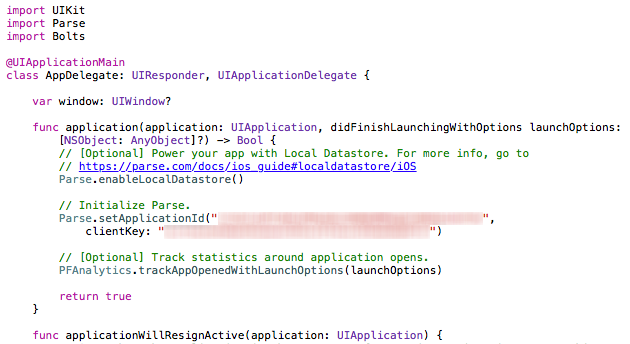 Just remember to update AppDelegate.swift with your Parse application keys. Don’t stop here, there is so much more to do. Try figuring out how to validate the email text field properly. The user doesn’t have a profile picture. Implement a feature to upload and save a profile picture. Add an option to login with Facebook. As you can see Parse does a lot of the heavy lifting for you, leaving you to concentrate on making a beautiful and useful application. Play around with it and happy coding! Hello! I have a question about your code. In HomeViewController.swift, you use the dispatch_async method and set main queue in viewWillAppear, I don’t understand why do this. It’s used in the if statement. If the current visitor is not logged in, navigate to the login scene, before home scene appears. dispatch_async(dispatch_get_main_queue() dispatches UI updates to the main thread asynchronously. Other than that, its a beautiful app. It sounds like you are developing in the the newer Xcode version. This tutorial was written for Xcode 6.4 iOS 8.4.